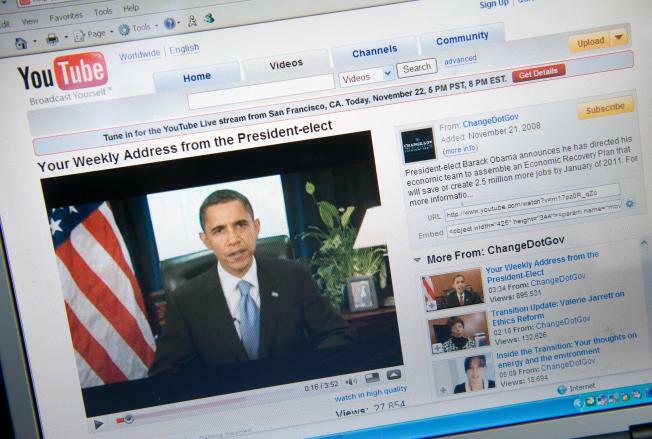 A YouTube video of US President-elect Barack Obama's weekly radio address is seen on a computer screen in Chicago on Nov. 22, 2008. Want a sleek Obama '08 coffee mug, a four-year calendar with pictures of Barack Obama on the campaign trail, or a blue T-shirt with "Change Can Happen" emblazoned under stylized photos of the incoming president and vice president? You’ll have to hurry. But they all can be yours for the holidays, if you go to Obama's campaign website and donate $15, $35 or $30 to the Democratic National Committee. So said a trio of e-mails sent since Obama's historic victory last month to the 13 million or so folks on his unprecedented campaign e-mail list, which has also been used to raise cash for Obama's non-profit presidential transition group and former rival Hillary Rodham Clinton's insolvent presidential campaign. But the flurry of fundraising e-mails has some subscribers pleading for a break from the solicitations and has raised questions about whether Obama has figured out how to harness the power of his online network once in the White House. In the five weeks since Election Day, Obama's once-cohesive Web presence has fragmented into a jumble of sometimes disparate-feeling fundraising pitches, YouTube videos and calls for activism spread across three websites. E-mails to the list of supporters have generated contributions to help victims of the California wildfires, invited questions for the transition team, prompted 500,000 responses to a survey about what Obama backers would like to do next and helped gin up thousands of house parties across the country last weekend, at which Obama supporters deliberated on how to maintain the campaign's grass-roots energy once he’s inaugurated. And, of course, there are the fashion and novelty sale items — including the Obama fleece scarf being hawked this week with a deadline duly noted to ensure delivery in time for Christmas. "So far, there's been an aimless wander" quality to Obama's approach, said Kevin Thurman, who helped direct Web operations for the unsuccessful Democratic presidential campaigns of then-Iowa Gov. Tom Vilsack and Hillary Rodham Clinton, the New York senator whom Obama has tapped as his secretary of state. "We've gone from a survey to selling holiday mugs that don't have a lot of holiday to four-year calendars — it looks like left-over inventory," Thurman added. There are some tricky legal questions about what Obama can do with his e-mail list after he’s sworn in as president and those behind his Web juggernaut concede they're still formulating just how Obama will use the Internet from the White House. So far, though, they have remained tight-lipped about their plans. They declined to comment for this story. But during a panel discussion this month, Obama's Internet director, Joe Rospars, predicted his boss's official online communications would become "more systematized once in government." In the campaign, he said, “We had a relationship between Barack Obama and a whole lot of people who supported him and his policies and his ideas and his vision for the country. When he becomes president, he needs to be president of all the people." The presidential transition team's website, change.gov, he said, focuses "more on transparency and accessibility and service and these kinds of things, rather than implementing a legislative agenda and sort of having a political organization." He deflected questions about specific plans, particularly about what Obama's continued online political presence would look like, explaining the "political mobilization stuff is a little bit of another question." There is some early evidence, perhaps predictably, of donor fatigue. In the 18 days after the election, Obama's campaign reported receiving $1.2 million from 4,200 itemized contributions, while the DNC pulled in $1.7 million from 3,100 itemized donations — both trickles, compared with the flood-like velocity of campaign fundraising. Obama was raising a minimum of $1 million a day at the close of the campaign. Donations also came in at a relative trickle to the Obama-Biden Transition Project, a nonprofit corporation set up under section 501(c)(4) of the Internal Revenue Service code. Using the Obama campaign e-mail list, it raised $1.17 million from 1,800 donors in the 11 days after the election. After Obama announced his economic and national security teams, subscribers got e-mails asserting the administration would need their help "to pass legislation that puts America on the road to recovery" economically, and to confront national security challenges. "With your support, we'll meet those challenges and opportunities with the hope and optimism that has brought us to this moment of change," campaign manager David Plouffe e-mailed this month. The continuing solicitations have prompted some Democratic Internet strategists — as well some list subscribers – to urge an end to them, or to question Team Obama's online tact. "Dear Mr. President-elect, please take me off your spam list," Slate senior editor Dahlia Lithwick wrote in a cheeky open letter to Obama, his wife Michelle, Plouffe and other allies who've signed fundraising e-mails. Continuing to receive such e-mails after Obama's campaign brought in a record-shattering $770 million — most of which came through the list and other online avenues — and won the election is "galling," Lithwick wrote, comparing it to "being asked to keep planting the victory garden, years after Armistice Day." Mimi Swartz, a journalist and Obama supporter, in a blog post titled "Yes, We Spam!" compared Plouffe's continued appearances in her inbox to "a boyfriend I broke up with who keeps trying to be friends. He keeps writing. And writing." Plus, it's "culturally tone deaf" to keep up the fundraising flurry while people are coping with "foreclosure, job loss and no medical insurance," suggested Stephanie Salter in a column in the Terre Haute, Ind., Tribune-Star. Ironically, Team Obama had not - until Tuesday evening - used the list to solicit donations to the nonprofit venture raising cash for next month's Inauguration, which last week reported raising the most cash: $9.7 million. The vast majority of that cash came from wealthy mega-donors and with little help from the small donors who made the list such a potent political tool. "This is the height of Obama interest, so they should use the list to ask for more money, but not just to ask for money for money's sake," said Thurman, who once worked as a senior strategist at the Internet consulting company founded by Rospars. Inevitably, Thurman said, "people are going to drop off the list to go back to their families and their jobs and because they don't have as much time to give." But, he added "if, after the inauguration, you continue to ask for money and not build it into a narrative that coincides with what President Obama or the Democratic Party is doing, then they've got an issue." Andrew Rasiej, an Internet strategist who sat on the panel with Rospars this month, explained in a telephone interview that Obama's Web presence is "somewhat disjointed" because of the necessary juggling between the campaign website, BarackObama.com and the transition team's. "It's still a work in progress, because they're mostly focused on making sure that they get their hands on the steering wheel of government," said Rasiej, who has worked for Democratic candidates and committees including Hillary Clinton and former Sen. Tom Daschle (D-S.D. ), just picked by Obama as the new secretary of health and human services. Obama's Internet team "may find its sweet spot after Jan. 21, once he's sworn in and WhiteHouse.gov (the official presidential website) is operational in a way that starts to mimic what we saw during the campaign," Rasiej suggested.